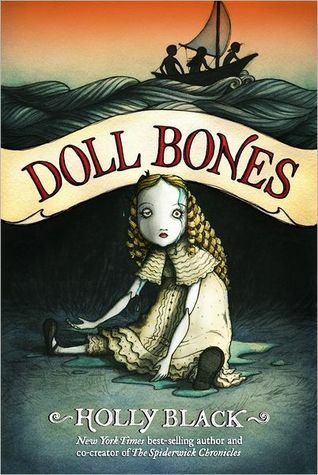 Doll Bones, by Holly Black. A Margaret K. McElderry Books, Simon and Schuster New York, NY, 2013. “He wondered whether growing up was learning that most stories turned out to be lies.” In Holly Black’s Newbery Honor book, Zachary Barlow struggles with growing up and away from childhood games, the return of his father, and a friend who insists a doll is demanding to be buried. Zachary, Poppy and Alice have an ongoing fantasy game with action figures that are very real to them. When Zachary’s father returns after an absence of three years, he feels Zach shouldn’t be playing with action figures, especially with two girls. He should instead concentrate on the basketball team. Zach is a good player and his dad is proud of his skill. When Dad takes the drastic step of throwing out Zach’s action heroes with the garbage, his dad explains, “He’s twelve years old, playing with a bunch of crap. He’s got to grow up…” Zach goes into a rage, but decides he can’t tell his two friends what his dad did. So he tells them he doesn’t want to play anymore, that they are too old to be playing silly games. His friends are shocked and blame it on his new friends on the basketball team and Zach lets them believe that. As his relationship with his two friends changes, he finds himself lying to them more and more. When Poppy comes up with an elaborate plan to save a mysterious doll, Zach goes along and soon the trio find themselves far from home on an adventure they hadn’t planned. Along the way, they all learn something about growing up and what’s true and what isn’t. The reader, however, will be held in suspense until the end of the novel and, even then, may not know exactly what happened. Was Poppy’s story true? Did the doll have the power to get what she wanted? Or was it just another story—a lie? Doll Bones will keep the reader turning pages until the very end.